Cases involving offshore helicopter accidents can be very challenging and demand highly skilled offshore helicopter crash attorneys. Usually, such cases arise in the context of transporting passengers to and from oil platforms at sea. 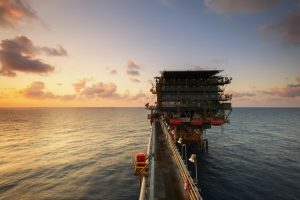 These passengers may include workers at an oil platform, inspectors, or those necessary to deliver supplies and equipment. Unfortunately, flights at sea also come with an enhanced risk related to weather and other adverse conditions that may be encountered when flying over water. And, as with any other flight, there is also the risk of mechanical failure or another malfunction due to a maintenance deficiency or a defectively designed or manufactured component part. As a practical matter, once an accident has occurred, locating and salvaging the wreckage of a helicopter that has crashed in open waters is very difficult, as is analyzing the metal components after prolonged exposure to salt water. All of these factors make determining the cause of the crash particularly difficult. Offshore helicopter crash cases are also legally complex. In addition to the applicable Federal Aviation Regulations, if the crash is determined to be significantly related to traditional maritime activity, federal admiralty laws, such as the Jones Act, may apply, which can limit damages and alter the procedural aspects of the case. Additionally, if the crash occurs more than twelve miles from U.S. shores, the Death on the High Seas Act will likely apply. Crashes that occur less than twelve miles from U.S. shores and that are not related to traditional maritime activities will likely be governed by state law. The offshore helicopter crash attorneys at Braden, Varner & Angelley, PC have successfully handled numerous cases involving offshore helicopter crashes and have the legal knowledge and practical experience required to obtain favorable results for our clients.